Lev Haolam director infiltrates Breaking the Silence tour of central Hevron, and sets participants straight in several languages. Attorney Nati Rom, founder and director of the Lev Haolam organization that ships products from Judea and Samaria worldwide, joined a tour of Hevron led by the radical leftist NGO Breaking the Silence where he tried to explain the situation to the European participants - in three languages. "During a publicity tour that I arranged, I passed next to a group of Breaking the Silence tourists. The guide told them stories slandering IDF soldiers, the Jewish residents and the state of Israel," said Rom. "This time I decided to get involved, to try and understand what motivates them and to try to understand where these falsified stories come from. However they decided to ignore me, to be silent and to run away." The attorney continued his description, saying, "I decided to join a tour and stood beside (European) members of parliament, I listened to the guide talk about IDF soldiers who just 'shoot, butcher and abuse innocent Arab civilians', as he put it." "When I saw them passing by a monument to the Levy couple and ignoring the story of how they were murdered, I decided to 'break the silence.' I asked them if they heard about Gadi and Dina Levy, the couple murdered on their way to pray (at the Cave of Machpelah), they responded with scorn, chose anti-Semitic statements and continued walking." He also asked them as European parliament members how they explain their funding of terrorists in breach of international law, and how they explain their double standards and hypocrisy. He asked them to stop and look at the picture of the Levy couple at the monument. 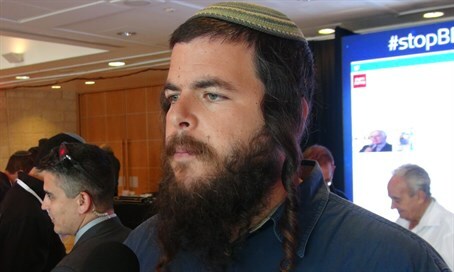 Accusing the Jewish activists of Breaking the Silence with demonizing Israel, he said, "the saddest thing is that they are residents of the state of Israel, who chose to turn their backs on their people and their homeland. I was there to see that in contrast to the agenda they present and despite their name 'Breaking the Silence,' they definitely are silent and then run away when you confront them with reality." "I view it as a moral obligation for each and every one of us, all those who received a drop of love from the state, to enlist in the struggle against these anti-Israeli organizations who try to harm our morality, our hold on the land here, and the state of Israel. The time has come to break the silence." Rom's organization Lev Haolam was founded around three years ago to help small businesses in Judea and Samaria survive boycott efforts worldwide. Every month it purchases a large variety of products from small local businesses, and sends them in packages to customers around the world.